Here is closer photo of some of the plants in the nursery that I have been showing the past few days. This is a tiny, delicate yellow flower amidst the red foliage. We have photos from Julie's recent raft trip through the Grand Canyon posted this week on our Viva la Voyage travel photo site. I have hiked to the bottom of the Grand Canyon (and back up), but have never rafted through it, which is a far superior experience. Here is another photo from the plant nursery. 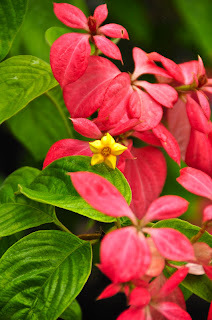 The tropical flowers in Costa Rica are indeed delightful. I walked into the the plant nursery after seeing the sign in yesterday's photo, and the man working there welcomed me to feel free to walk around and take photos. With the lull in the new construction market, there is less demand for new plants, but the nursery had a nice selection of flowering plants and trees. This sign advertised a nursery, obviously selling both fruit and ornamental plants. I decided to stop and take a look, though the viewfinder of my camera, of course. Near the cows that I stopped to photograph, which I showed yesterday and the day before, was this typical rural Costa Rican house. I like the way they made a little gate for the entrance to the house. They even put a tile roof on the gate, even though most Tico houses have tin roofs rather than tile roofs. While I was taking the photo of the calf that I showed yesterday, this cow kept a close eye on me. I think it wanted to make sure I kept my distance. It worked. I did. The large hump on their shoulders, the floppy ears, and the dewlap skin below the chin are distinctive traits of Brahman cattle. They are the most popular cattle in our area because they tolerate the warm climate very well. What could be be a better location for a calf than to be up to one's eyeballs in a lush field of flowers? Tomorrow I will show you an adult cow that was keeping a close eye on me as I took this photo of a calf. Not nearly as cute an image. Today is Sunday, so we have new photos posted on our Viva la Voyage travel photo site. This week we are showing photos from Julie's recent raft trip through the Grand Canyon. It took 10 days and is a once-in-a-lifetime experience. If you have not had that opportunity, you will want to take a look. A fisherman retrieves his dinner. Continuing with my little series of photos showing a local fisherman in the mouth of the Langosta Estuary, here the fisherman walks towards his net to scoop up his catch. A couple of days ago Memphis MoJo left a comment with a link to an article in USA Today that reported that Costa Rica has been rated as the happiest country on earth for the second year in a row. The Costa Rican newspapers have carried similar stories. The index in which Costa Rica is rated ahead of every other nation is based on measures of health care, life expectancy, environmental sustainability, and other quality of life indicators. And if you did obtained your dinner by wading into the warm surf of the ocean, wouldn't you be happy, too? We have photos of Peggy's Cove, Nova Scotia on our Viva la Voyage travel photo site this week. Here is a closer view of the local fisherman casting his net into the mouth of the Langosta estuary. After each cast, he would pull a cord that closed up the top of the net, trapping the fish inside. I think he and his friends enjoyed being able to bring back dinner while getting a little exercise and spending time barefoot on the beach. The day before yesterday Kate of Visual St. Paul left a comment asking a question if there are a lot of lobsters on our beach, as langosta means lobster in Spanish. The only time I have seen lobsters is when fishermen have brought in a few of them in a bucket along with their fish. Some of the Tamarindo restaurants serve fresh lobster, so there must be local lobster around, although I don't know exactly where their lobster comes from. We do not have commercial fishermen on our beach. We see a few local folks fishing for themselves, and some people fishing just for recreation. This fisherman is casting a net into the mouth of the Langosta estuary, scooping up little fish who are being carried from the estuary into the ocean. I guess it is easier for the fish to come to him, than for him to find the fish. This is the southern end of Playa Langosta. This woman is evidently covering up for protection from the sun. Or maybe it is simply for fashion. You can see a long stretch of sandy beach across the mouth of the Langosta estuary, with some people riding horses on the beach in the distance. The portion of Langosta beach that you see in this photo can be reached by wading across the estuary mouth, but if you want to drive there by car, it will take about 20 minutes, and you will have to talk your way past the security guard at the gate of the 5,000-acre master planned Hacienda Pinilla project, home to several resorts, including the J. W. Marriott Guanacaste Resort. At low tide, there are lots of tide pools in the volcanic rocks along parts of Playa Langosta. We love to walk along the sandy beach, but it is also a diversion at times to walk across the tide pools and watch the fish and crabs scurrying about. Tomorrow I will show a sandy part of Langosta beach. After walking home from dinner, here is the scene that greets us. Straight ahead you can see the clouds over the ocean. The front door to our Langosta condo is on the left. This presents a tough decision. Should we open a bottle of champagne to sit on the balcony/patio to listen to the surf and watch the clouds drift across the ocean in the night? Such decisions could make life in Costa Rica stressful. Who else might you see while walking home from dinner in Tamarindo to our condo in Playa Langosta? In addition to the bird yesterday, you might encounter a crab like this. At certain times of the year, crabs like this will walk across the beach road at night. They are about 2 - 3 inches (5-8 cm) in size. I suspect that the reason that they cross the road has something to do with the reproductive cycle, but I am ignorant of that subject about crabs. I apologize to those of you who sometimes leave comments saying that they learn things on this website. I think I will stay ignorant about crab reproduction. UPDATE: Please check the comments below. Kate from Visual St. Paul has posted a poem about crabs that will delight you. Today is Sunday, so we have new photos posted on our Viva la Voyage travel photo site. This week we are showing photos of Peggy's Cove, Nova Scotia, including its picturesque lighthouse and seascapes. In the darkening skies of dusk, a bird perched in a tree along the beach. I don't know what type of bird it was. We most commonly see pelicans, but this is not a pelican. Its posture makes it look like a bird of prey, but we do not usually see them along the beach. If they eat geckos or crabs, night would be a good time to perch on the beach. The bird is the shape of a heron, and we do see herons and egrets on the beach from time to time, usually looking for fish. This week we have photos of the architecture of Cambodia posted on our Viva la Voyage travel photo site. We spent so much time eating and taking photos of the sunset from our beachfront table at Nogui's that before leaving I took this photo in the dark, in contrast to the photo I posted several days ago of the scene earlier in the evening. Nogui's is located at the "circle" at the end of the beachfront road in the older part of Tamarindo. It has been in business a long time and is a favorite of locals, as well a popular with visitors. Costa Rica does not have street addresses. The "circle" is the end of the beachfront road, and many businesses will give their location by saying they are a particular distance from the circle. Julie and I will often walk to dinner along the beach from our condo in Langosta to the main part of Tamarindo, and then walk back along the road. Tomorrow I will show you what might be encountered in the dark along the beach. I like how the sunsets evolve and deepen in color. This is the last sunset of this series of photos that I have been showing during past week or so. In this photo, the sun is about to drop behind a marine layer of clouds on the horizon, which is typical for this time of year. Of course people such as the woman in yesterday's photo will want to photograph Tamarindo sunsets when they look like this, which they commonly do. This is why they call our area Costa Rica's "Gold Coast." I like the fishing boats silhouetted against the gold sky and sea. 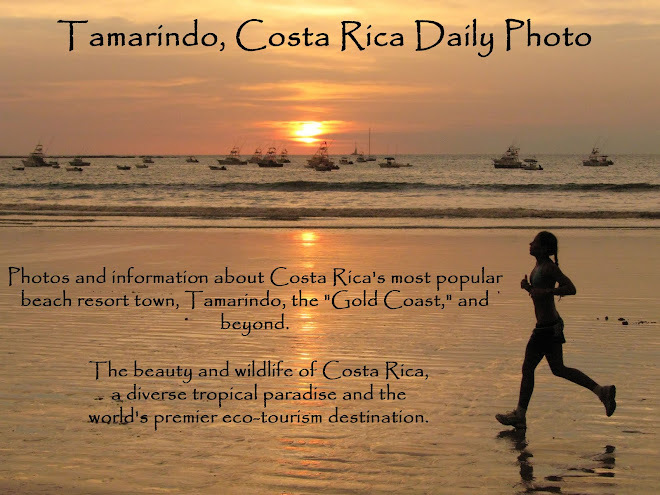 There is no pier or marina in Tamarindo. The southern end of the bay is sheltered by a reef and island, which allows boats to be moored in this area. I looked down the beach, which was starting to thin out, with fewer people in the water as it got later, and others were there with their camera to photograph the sunset. I will show whether the sunset was worth photographing. Tomorrow, of course. We are showing photos of the architecture of ancient Cambodia on our Viva la Voyage travel photo site. Even though it is dusk, there were still people out on the beach, including a few still in the water. The water is warm enough for swimming all year 'round. I don't think I have ever seen swimmers with a wet suit in Tamarindo. In contrast, I find the Pacific in California too cold for my tastes, although I used to go swimming in the ocean often as a child. I must be a sissy in my old age. Sunset cruises are popular in Tamarindo. The catamarans leave Tamarindo in the afternoon, stop near several rocky islands for snorkeling, then they serve food and drink on the way back to Tamarindo at sunset. Today is Sunday, so we have new photos posted on our Viva la Voyage travel photo site. This week we are showing photos of the architecture of Cambodia. This is a photo of Nogui's, an old, traditional and very popular seafood restaurant on the beach in the main part of Tamarindo. It features fresh fish, as the fishermen bring their catch in from their fishing boats near this spot on the beach. As you have seen in my photos I have posted recently, while Julie and I ate here we could not resist taking a few photos of the sunset and people on the beach while we enjoyed our drinks and waited for our meal. Julie is in the bright orange shirt on the patio. Like virtually all restaurants in Tamarindo, Nogui's is open air. There are no exterior walls to allow a breeze cooling breeze. We are showing photos of dazzling Bangkok, Thailand this week on our Viva la Voyage travel photo site. This is the equivalent of commuting in Tamarindo -- walking along the beach, heading home with a surfboard. The beach is a little like Tamarindo's main street. This is the view down Tamarindo beach from the location of the beachfront restaurant. This is the main and most crowded section of the beach, and of course the telephoto lense compresses the density of the people. Some people are enjoying a late afternoon walk along the beach, while others are waiting for the sunset. Tough decisions. With yesterday's photo, I naturally tried to move a little to see if I could get a photo of just the surfer holding his chin, as it would evoke the classic image of Rodin's "The Thinker" sculpture. This was the best I could do before the surfer changed his pose. What might he be thinking? It could be, "Will there be a good sunset?" Or maybe, "What will the surf be like tomorrow?" Nah. I think it is most likely, "Will there be any good looking girls walking this way, and where will they be heading?" A few minutes before the sunset, I took this photo of two surfers sitting under a tree, waiting for the sunset. I like a beachfront restaurant. There is always a nice view of either the sky, ocean, beach, or people on the beach. In the last light of the day, a paddle boarder was coming in towards the beach. Julie and I were having dinner at a beachfront seafood restaurant at sunset, and before our meal came Julie got up to take a photo of the sunset, and I took these photos of the last light of the day on Tamarindo bay. This is a view of the same scene as yesterday. Dusk was settling in across Tamarindo Bay, with the color of the sunset. There is something in the center of the photo, which I will show in grater detail, tomorrow. Today is Sunday, so we have new photos posted on our Viva la Voyage travel photo site. This week we are showing photos of dazzling Bangkok, Thailand. Julie and I went there for the first time 3 months ago and loved it. This is a photo of the scene that Julie was photographing in the photo I showed yesterday. The clouds over Cabo Velas at the southern end of Tamarindo bay were catching some of the light of the sunset. This week we have photos of the elegant villas and gardens of the Borromean Islands in Lake Maggiore, Italy, posted on our Viva la Voyage travel photo site. Today's worldwide Daily Photo Theme is "Tranquility." What could be more tranquil than relaxing at the end of the day, with the sun setting into the Pacific Ocean, and gentle waves lapping at the shore? Well, taking photos of the sunset might add to the tranquility of the scene for photographers, as Julie is doing here, so I took yet another photo of her taking a photo. Yesterday Brattcat left a comment about a friend who broke an ankle in Costa Rica and received excellent medical care. Fortunately, I have not needed emergency care in Costa Rica, but health care in Costa Rica is rated as the same quality as the USA. In fact, medical tourism is popular, with Americans coming to Costa Rica for medical and dental procedures at a fraction of the cost. When Costa Rica abolished its military in 1948, it redirected the money to health care and education. When the USA passed President Obama's health care reform, Rush Limbaugh said that he might move to Costa Rica, but he was evidently not aware that there is already a system of public health care here.